Have you missed me?! It's rare that I take a day off from blogging, let alone three! I've just been so busy with various projects that I haven't had a chance to post anything. Before I get to my card for today, I just want to say a big thank you to all the cards and wonderful birthday wishes I got from everyone! My card today is for Beate's WSC. I don't normally do the smaller 4 1/4 square cards. However, I have a friend that wants me to make a set of cards this size for her, so I figured, why not adapt the sketch to what I need. The card is fairly straight forward and once again, I'm off and busy with other things for the weekend. My mom is coming to visit and I am so excited! I've not seen her since June when we moved from South Carolina to Rhode Island. On that note, I want to let you know that I won't be posting next week. Have a great Thanksgiving Holiday, everyone! I am pleased to announce that I have been invited to be a contributing blogger for GHOFS.net. This is an awesome General Hospital website and I feel honored that Robin has accepted my offer to help. There are many other fabulous ladies that will be contributing as well. New updates and info are already posted, including my first post recapping yesterday's episode. I hope you have time to visit and let us all know what you think! P.S. 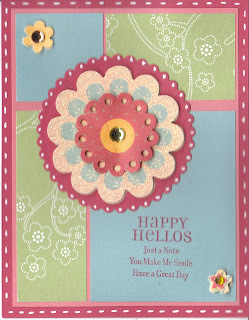 I did post a card for today...scroll down for my Mojo Monday post! Sorry about being MIA for the last couple of days. I hope you all had a good weekend. Mine was great! Saturday night, DH and I attended the USMC Birthday Ball and it was a blast. General Cartwright, who is the Vice Chairman of the Joint Chiefs of Staff, was our guest speaker and imagine our surprise when we figured out that the head table was right beside ours. Trust me, there is something very humbling about sitting 10 feet away from someone who wears 4 stars on his shoulder and is definitely someone who does a lot of "behind the scenes" stuff for a lot of current issues....but I digress! I was able to do some crafting; but it wasn't blogging crafting unfortunately, so I tried to play catch up today with the WSC from Beate. I started with a standard size card base in Brocade Blue and then I added a small layer of Artichoke Print Pattern paper from SU. I added a piece of Bravo Burgundy which I punched the bottom of with my EK Success threading waters punch. 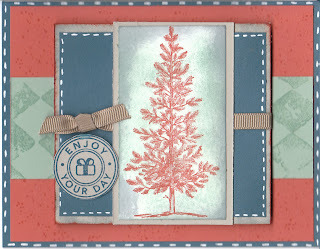 Next I ran a piece of Blush Blossom through my CB with the embossing folder. I used my 1 inch square punch for the Brocade Blue squares at the bottom and then added 7/8 squares in the Artichoke Prints Pattern on top of them. I added each one of those squares to the strip of Bravo Burgundy at the bottom. 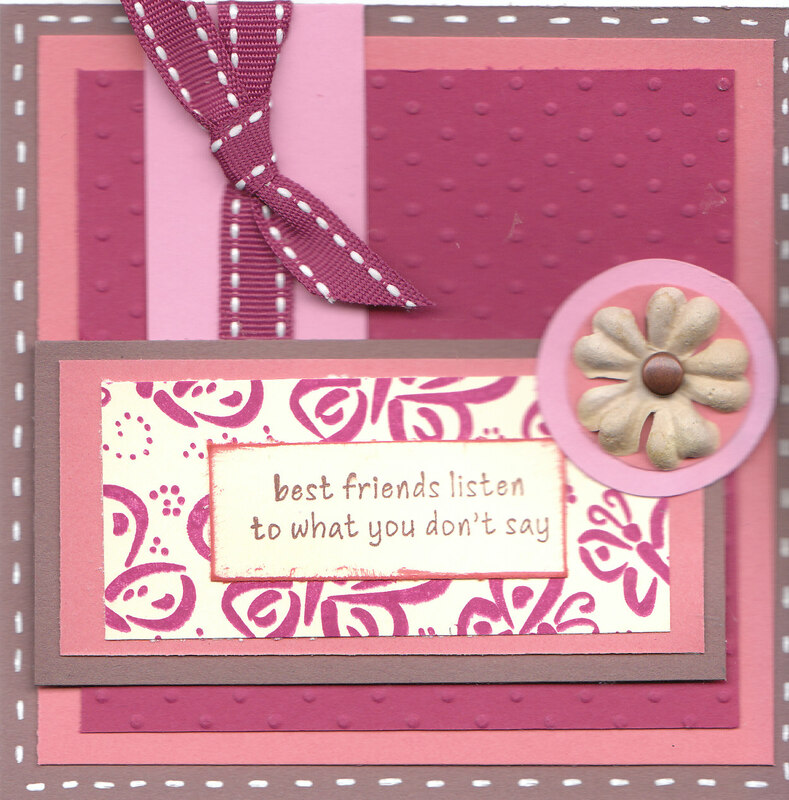 The sentiment is from SU's "Best Yet" stamp set. I used SU's "Lots of Tags" Sizzix four pack of dies for the label behind it. I know that normally I try to take measurements and I did in the beginning and I even wrote them down; but then I changed them and didn't write down the new ones! Anyhow, that's all for me today. Have a great evening! Well, I didn't think I would have anything to share with you today; but I was able to do a bit of stamping last night while I was watching a movie with DH. So, here is my card for yesteday's SCS sketch challenge. I also combined it with this week's color challenge to use Bravo Burgundy, Kraft and Vanilla. This is a gorgeous color combo and I'm glad I was able to do it. I started with a 4 1/4 x 11 piece of Bravo Burgundy that I folded in half. Next I added a 4 x 5 1/2 piece of kraft. The two burgundy squares are both 2 1/2 x 2 1/2. I stamped a piece of Vanilla card stock with go to "Fine Lace" background stamp in Bravo Burgundy ink and then cut into two 2" in squares to layer on the Burgundy squares. Next I added a 2 x 4 1/2 piece of Kraft card stock with foam dimensionals to the center of the card. The main floral image in then center is from SU's retired hostess set "Echoes of Kindness" I stamped it in Bravo Burgundy ink and then used my aqua painters and the ink pad to color it in. 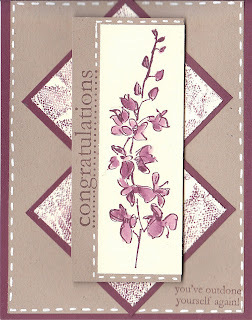 The "Congratulations" on the side is also from SU and I stamped it, along with the sentiment at the bottom with Basic Brown ink. Finally, of course, I added the faux white stitching lines around the edges of the Kraft pieces. I've been doing that a lot lately, I know; but what can I say, I just really like it! Ok, that's all for me. I hope you like it and I'll see you tomorrow! I have not participated in the MMSC in a couple of weeks. To be honest, the last few sketches have scared the bejeebers out of me! I really thought there was no way to compete with the talent I was seeing on Priscilla's blog. That is a seriously awe-inspiring DT over there! I know that it's not a competition; but we all know that we judge our own creativity even if no one else does. There were just so many different elements and layers to the sketches that I just didn't feel like I could make anything that would do the sketch justice. I took a gander again this week and decided that this one seemed challenging but at least doable for me, so I decided to take a stab at it. There were a lot of layers with this one as well; but they were easy layers to work with; and truthfully I probably added more than the sketch called for...how's that for irony! Since there were so many layers this time, I didn't measure each of them. I can still give a general breakdown of the card however. I started with a standard size Close to Cocoa base. 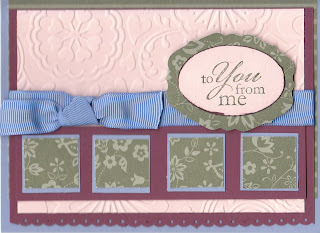 Next, I added a layer of Blush Blossom which I ran through the CB with the Swiss Dots folder. 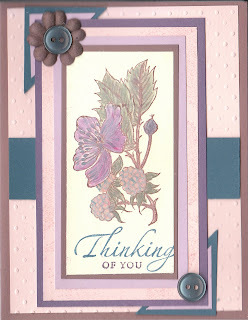 The two purple colors in the card are Perfect Plum and Pale Plum and the last color I used was Not Quite Navy. 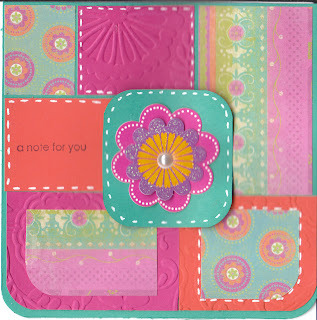 The Blush Blossom piece in the center behind the image is actually stamped with my favorite background stamp, "Fine Lace"; but it's hard to see in the photo. I stamped the main flower image, which is from SU's retired "Fruit Stand" in Cocoa ink and then used my blender pens with Stampin' Pastels to color it in. 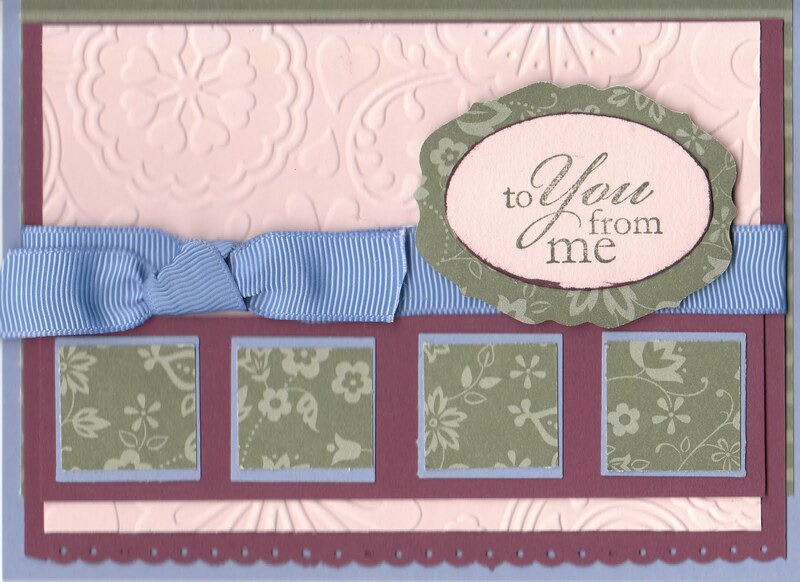 I added the buttons and the prima flower as the final decoration to finish the card. I know the orginal sketch calls for an additional element in the lower left corner; but I just couldn't make it work for my card, so I opted to leave it out. So, there were are. I was pretty pleased with how it all turned out. I hope you like it as well. Since today is a holiday, there'll be no crafting for me as I intend to spend the day with family and friends. Therefore, I won't have anything to share again until Friday. Until then, have a great day! So, here is my card for yesterday's Mojo Monday. I have to say, this is definitely not one of my favorites. I don't know why. I liked all the individual elements of the card; but somehow when they all came together it just lost something. Still, I don't have time to do another one, so this is just going to have to do! I started with a standard 4 1/4 x 5 1/2 Really Rust card base. Then I added a layer of pattern paper. Sorry, don't know where it came from, it was just in my stash. I added a strip of Kiwi Kiss at the bottom and layered that with some So Saffron. I stamped the images from Pocket Silhouettes with Really Rust Ink. 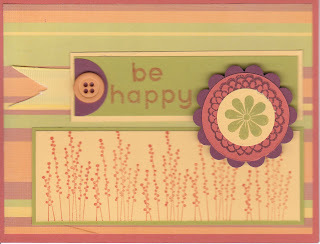 I cut another strip of So Saffron and layered Kiwi Kiss on top this time and added the "be happy" sentiment from Little Yellow Bicycle "Zinnia" set. I used my scallop circle punch for the Bravo Burgundy scallop circle and then cut a 1 1/2 inch Rust circle. 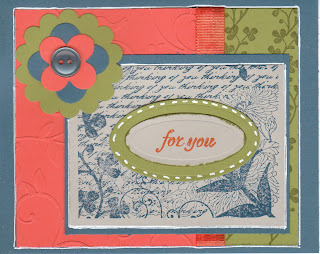 The scallop stamp around the olive flower is also from the Zinnia collection and so is the flower. So, as I said. Not the best; but I hope you like it anyhow! Have a great day! I hope you are all off to a fabulous weekend so far. It is chilly fall day here in RI and I am busy crafting for my church bazaar. Here is my card for yesterday's "Get Sketchy 13" challenge. When I first saw the sketch, I thought there's no way I can do this, that's just too many squares and layers to try to figure out how to put on the front of a card. Still, I decided in the end that that's the point of a challenge, right? To try something outside your comfort zone. So, this is what I came up with. I started with a 5x 10 piece of Bermuda Bay which I folded in half. 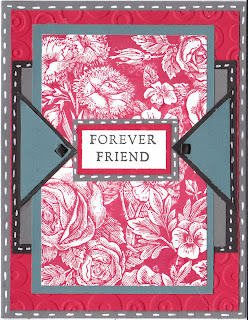 I then used different pattern pieces from my Prima Marketing Sasha Paper Collection. No, I didn't take measurements this time for you! Like I said, lots of squares and pieces. 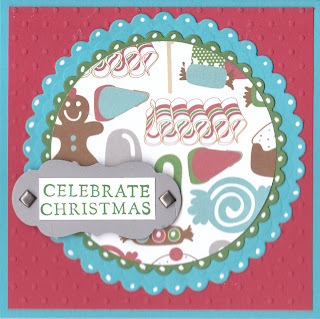 The other solid pieces are Melon Mambo and Dusty Durango which I ran through my cuttlebug to go along with the extra challenge for dry embossing. The flower in the center is from Recollections and I mounted that onto a piece of Bermuda Bay. I rounded the corners before adding it to the center with foam dimensionals. 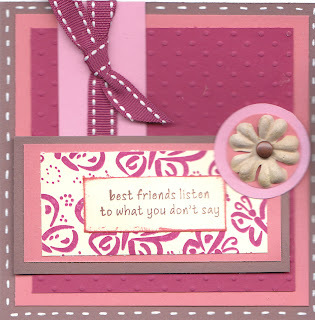 The sentiment is from SU's "Sweet Little Sentiments" which I stamped in Razzleberry ink. Finally I added the white gel pen faux stitching lines, which I know have been a staple for me lately; but I just really like the look of it! So that's all for me today. I'll be back on Monday. Enjoy the rest of your weekend! I am happy to report that Tyler was able to return to school today and everyone else in the house seems to be fairly healthy as well. I do have a card to share today and I will post it in a little while. First, however I wanted to take a bit of time this morning and talk about some other things. I've never really made a big deal about being a SU demo, simply because my blog is not an SU only blog and I tried to keep the two separate. Now, as many of you know SU recently came out with a new demo agreement that they wanted demos to sign. If you are a demo, you already know the particulars of that agreement. If you are not, then it doesn't really matter. Suffice it to say that I have decided not to sign the new IDA. I had been actually thinking of not continuing being a demo anyhow for a variety of other personal reasons and this just made the decision that much easier. As such I am now going to sell some of my SU stamp sets that I no longer use or have an interest in. There is so much other merchandise from other manufacturers that I would like to have; but I really need to clear some space in my craft room. So far I am only listing stamp sets; but I may decided to add some accessories and paper later. If you are interested in purchasing any of these sets that I have listed, please send me an email at jdshelton3@yahoo.com and let me know the set(s) you would like. If you need to see a picture of the set, let me know and I will get one to you via email. I will accept paypal or personal check. Payments must be received before I send the merchandise. All packages will be sent in flat rate envelopes or boxes through USPS. If you purchase $25 or more, I will pay the postage fee. "Flowers of Gratitude" (remounted on cling foam"
I hope you all had a fabulous weekend. Ours was so wonderful and so busy. So busy that I didn't have time to do any stamping or creating this weekend, so therefore I don't have anything creative to share with you. I thought, however that I would post a couple of pictures of the events that took place this weekend. I even added a video for you! We did, of course, go trick or treating on Saturday; but I've not uploaded those yet. First, as you know from Friday's post, it was Jonathan's birthday and we just had a small family celebration here at home. He got to celebrate in preschool as well, though. He loved his presents and spent the majority of the weekend totally entranced with them. Then it was off to Providence for Reagan and I where I took her to see her very first concert. 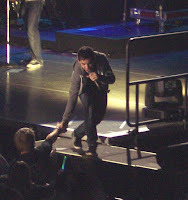 Demi Lovato and David Archuleta. It totally rocked, I have to say. Yes, I managed to get there and back despite my trepidation for driving in downtown Providence! So, that's all for me today. I hope you like this rare glimpse into my family...I know I don't post too often about them. Have a great day and I'll see you tomorrow!